Just like Annick Goutal, a free, bold and uncompromising young lady. Initially, a sweet pea, a flower in the city. If the general PR speak, the New York City references,2 or the recruitment of French street artist Nasty to decorate the press launch and the limited edition bottles (see below) led you to expect a young, edgy juice for Annick Goutal's new Vent de Folie, you were at least half right. Vent de Folie is, indeed, youthful. It's a fresh floral with a lively berry + citrus opening, nondescript (and light in any case) floral notes and plenty of pale, slightly bitter greenery. The early stages have a textured finish or "effect", somewhere between metal and stone; the later stages have a light dusting of powder. The dry down is clean but not laundry detergent-ish. It is transparent from the beginning straight through to the end; in synesthesia terms, I picture it in washed-out pastels and shades of cream, very like the sunlit upper left hand corner of the advert shown above. Verdict: Vent de Folie is entirely modern; it might be what Annick Goutal would have created for her young daughters in 2014 instead of Eau de Camille and Eau de Charlotte (both early 1980s). As a cranky old-school perfumista, of course I think those two fragrances have far more charm than Vent de Folie (and for that matter, so does Petite Cherie, and if you want some little bit of folie served up with the girlish charm, I'd think you'd be better served by the brand's Folavril).3 Still, Vent de Folie is just fine if you're after something more up-to-date and office-appropriate. It's well done and wearable, and perfectly pleasant — wearing it several days in a row was not a chore, and while it's youthful, it's not so overtly young (no cupcakes!) that anyone over the age of 30 would feel silly wearing it. The lasting power is far better than I'd have expected given the sheerness (two good sprays make it through most of the day). Annick Goutal Vent de Folie was developed by perfumer Isabelle Doyen. The notes include blood orange, geranium rosat, blackcurrant, raspberry, hedione, white musk and cedar.It is available in 50 (€74) and 100 (€98) ml Eau de Toilette. The 100 ml bottle is also available in a limited edition "tagged" by Nasty (shown just above, €98); 150 were made. 1. Via the Vent de Folie website. 2. 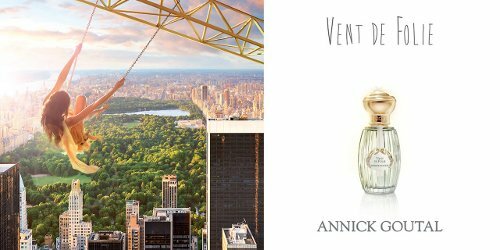 References to New York as a fragrance inspiration nearly always turn out to mean the opposite of bold and uncompromising, perfume-wise: witness DKNY MYNY, Elizabeth Arden Untold, Calvin Klein Downtown, and the whole of the Carolina Herrera 212 line. 3. I am pretty sure that both Camille and Folavril are discontinued but I do not know if they are still easily found. Do comment if you know! Those LE bottles are so, so pretty. Nice to see some personality in the bottles after they were all standardized recently. Maybe next time we’ll get some personality in the juice, too! Oh, it’s such a shame they moved everything into clear glass…I loved the colors of Mandragore & Nuit Etoilee. Hoping Vent de Folie will make them a gajillion dollars & they’ll bring back the colored glass. I am very happy that I have some of the nice colored bottles – the green in Ninfeo Mio is especially pretty. But if clear bottles helps keep the ship a float, then whatever. I’m just happy they kept the ribbed bottles. That was a pretty one too, I’d forgotten. NE is much closer to perfumista-bait…I’d certainly make a bigger effort to get that one! This sounds so uninteresting, people aren´t even commenting! I sincerely wish Goutal success selling this to young people who are afraid of standing out – the imaging is great, which is a good start. However, I hope their next launch will feature some beautiful ingredient and focus on people who actually care about perfume. It’s not what most perfumistas would think of as interesting, but it’s better done than most light inoffensive scents for young people. So there’s that. If some mainstream designer brand had released it, I’d have been more impressed, but yes, it’s not what most AG fans are after. Folavril no longer on AG’s website – don’t think it was as hugely successful as, for example, the Hadrien range, so would imagine anywhere that still stocks it the bottles would have to be pretty old by now; I remember it being a really lovely fragrance, I got a sample back in the day when if you bought one bottle at full price the SA happily gave you a vial of practically everything else in their then (much smaller) range. I’d also be dubious about buying Camille should I find it anywhere, again I’d think it’d have to be old stock – & as you know how much I loved it, I’d hate to buy & bottle & find it had gone off – what a letdown that would be! However, I may pop in to their London shop during my Dec trip & have a chat with the SA. On a different topic, Robin, Saks don’t have a branch in Seattle, so I can’t take up your previous recommendation; however, the Neiman Marcus (or, as an old friend from Houston termed it, Needless Markup!) store is in the neighbourhood where the friends we’re staying with live, so it’s definitely on the ‘to do’ list; thanks again for the info. I was wondering if either were still sold in the AG boutique in Paris, which I understand still has some things they don’t sell online, like Fier. Totally agree it’s worth being careful, esp. since some of their perfumes (Petite Cherie!) don’t have a great shelf life. Good, hope NM will have a decent selection. My local store has a full counter of Maison Francis Kurkdjian, a separate installation for Tom Ford including all the Prive scents, and generally just a good selection — many things not in other department stores.